Ahead of the South African premiere of the much acclaimed Krotoa Eva van de Kaap, the Aboriginal /Xarre Restorative Justice Forum (A/XRJF) partnered with Artscape and the University of Cape Town to hold a ground-breaking colloquium that explored the opportunities this theatre production offers for healing the wounds of the past. From left Tauriq Jenkins Chair of the Aboriginal /Xarre Restorative Justice Forum, Dr June Bam-Hutchison of the UCT Centre for African Studies, Krotoa Eva van de Kaap Director Basil Appollis, UCT PhD Candidate Kershan Pancham and playwright Prof Sylvia Vollenhoven. 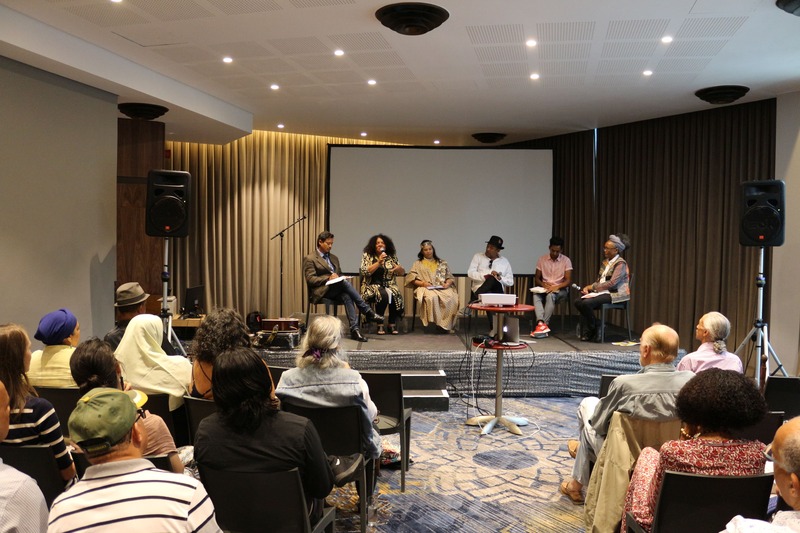 The discussion forum concluded unanimously that Krotoa Eva van de Kaap is more than just a theatre performance… the story of Krotoa offers a unique opportunity for Restorative Justice. More than any other group, indigenous women have borne the brunt of the brutality of colonialism and its 20th Century handmaiden, apartheid. The story of !Goa/gõas of the Goringhaicona known as Krotoa or Eva van Meerhoff is echoed repeatedly throughout the ages… A woman enslaved, abused, drained of her usefulness and discarded. The discussion forum, called The Invocation of Krotoa: The Arts & Restorative Justice, explored the fact that decolonising the violence against indigenous women is doubly difficult because of the marginalisation of the First Nations people. “But when artists and stories like !Goa/gõas of the Goringhaicona enter the fray, it disrupts the unacceptable order of things. People around the world are using The Arts as a way of fast-tracking the changes needed to redress gross historic injustice… harnessing our collective power for social change. “The production of Krotoa Eva van de Kaap at Artscape (a collaboration with the Volksoperahuis of the Netherlands) is much more than a play. It is a conduit, an invocation of the spirit of !Goa/gõas so that she speaks to 21st Century audiences. The story of !Goa/gõas and other plays I have written (The Keeper of the Kumm and works looking at the lives of writer Richard Rive and assassinated human rights activist Dulcie September) is helping us define the terms of Restorative Justice… a movement that advocates healthy responses to harm and not inflicting more harm,” said one of the Forum coordinators and author of the Krotoa play, Prof Sylvia Vollenhoven. Krotoa Eva van de Kaap opened to acclaim in Amsterdam in October 2018 before enjoying a lengthy tour of the Netherlands. The play was given a standing ovation on opening night and at most of the subsequent performances. The play is directed by Basil Appollis and stars Bianca Flanders as Krotoa and Kees Scholten of the Volksoperahuis as Jan van Riebeeck. He also plays Krotoa’s husband Pieter van Meerhoff. The original music score is written and performed by Frazer Barry and Jef Hofmeister (NL) who both play cameo roles. The play will run at the Arena at Artscape Theatre Centre from February 7th to 16th. Booking at Computicket.